With the nanoStream Chrome Plugin you can stream video using your Windows PC’s Web-Camera or capture the screen activity of your Windows desktop using Chrome browser. The resulting videos can be streamed through an rtmp server for live viewing in a remote browser or can alternatively be saved to disk as an MP4 file for later viewing. Google Chrome Browser (version 42+, please note that starting with Chrome 45 older versions of nanoStream PlugIn will not function). 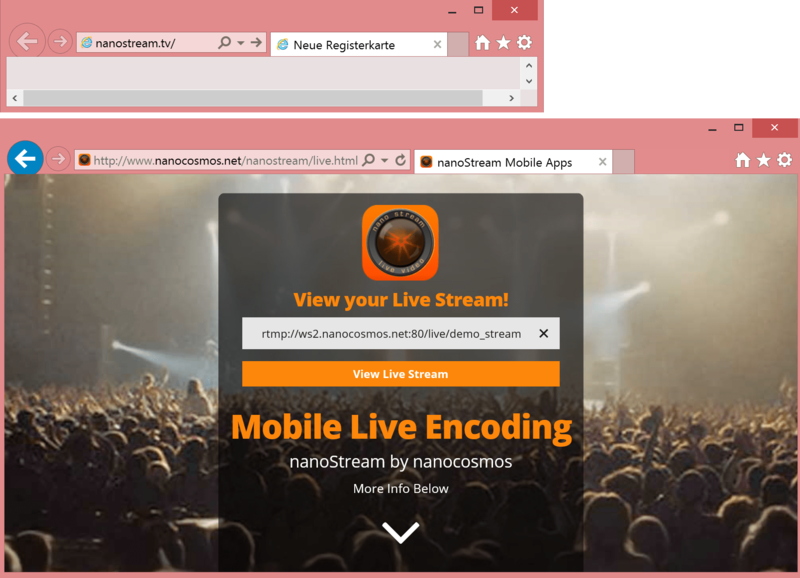 Please uninstall any versions of nanoStream Live Encoder Extension already installed in Chrome browser (type chrome://extensions in chrome’s address headline and remove nanoStream if present). 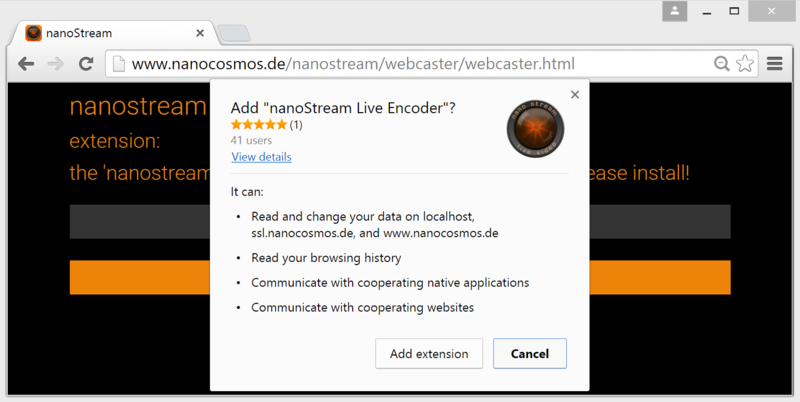 Open the Page http://www.nanocosmos.de/nanostream/webcaster/webcaster.html in your Chrome Browser and click on Install Extension (you can also go to the Chrome Webstore to find the extension). Add extension to Chrome. 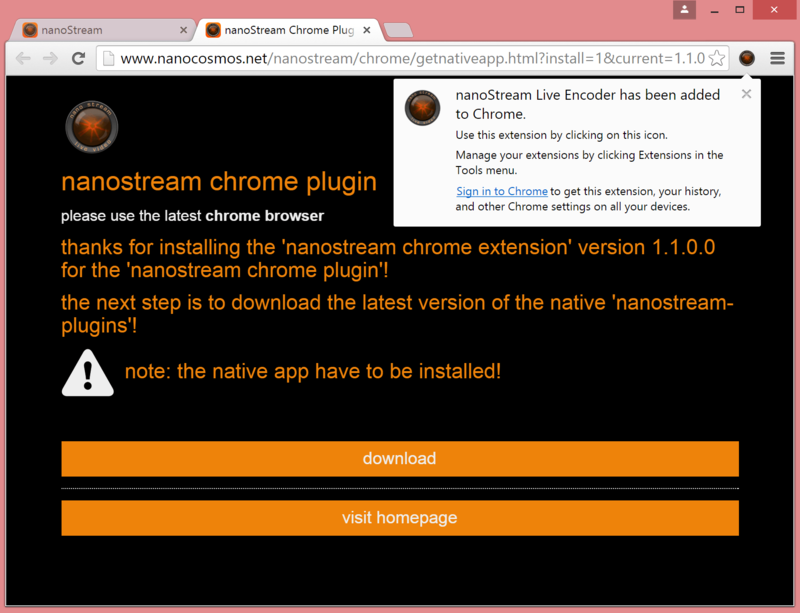 After the nanoStream Chrome Extension has been successfully added to your Chrome browser, download the native nanoStream Live Encoder plugin: the file ‘nanostream-plugins.exe’ will appear in your download folder, execute it to install the plugin. To proceed with the plugin installation, please accept the licence agreement. If you have installed an older version of the plugin installed please uninstall old version during setup (note that the plugin version you can find in the properties of the file nanostream-plugins.exe). Open the page http://www.nanocosmos.de/nanostream/webcaster/webcaster.html using Chrome. 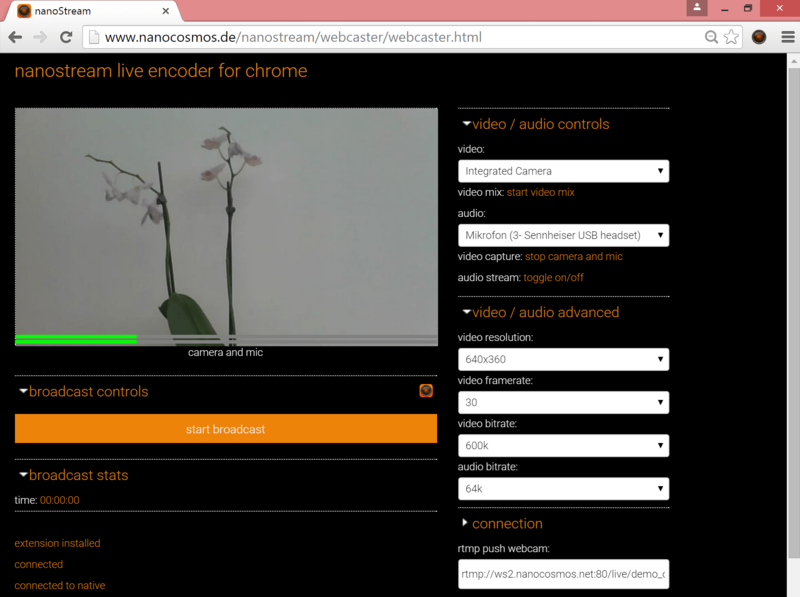 Default parameters are provided and a Preview is available before Streaming with Start Broadcast. Under Video / Audio controls it is possible to choose between the desktop’s integrated camera or to make a live screen capture or to choose from available audio sources. 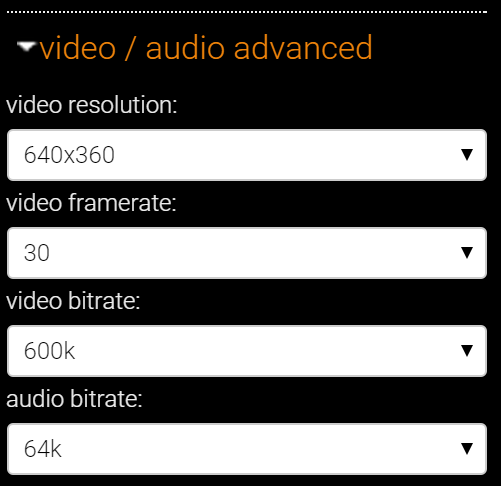 Optionally, adjust the Encoder Settings under Video / Audio advanced. Video Resolution is available in the range from 320×180 to 1280×720, Video Framerate can be selected to either 15 or 30, Video Bitrate ranges from 100K to 3500K and Audio Bitrate from 32k to 192k. In the Connection field an rtmp URL is provided to identify the stream. To view the stream live, open a web browser in a remote computer (or for testing purposes on the same computer) and go to www.nanostream.tv (you will be redirected to http://www.nanocosmos.net/nanostream/live.html?id=). In the field prompting you to „Enter your stream ID to view stream“ type the complete rtmp address you provided in the Connection field.